These melt in your mouth kourabiedes (Kourabies (pl. kourabiedes, pronounced kou-rah-be-EH-thez), as most of you, who follow my blog, must know by now, are the Greek shortbread cookies made during Christmas. In the older times, before the use of the mixer, these cookies needed elaborate preparation and that was done by hand, so these were made for special occasions such as weddings, christenings and other celebrations. Traditionally they were flavoured with rose water or blossom water. Local butter, usually ewe’s and/or ewe’s and goat butter is used and roasted almonds are sometimes added. They are then formed into round or crescent cookies which, after baking, are then coated with confectioners’ sugar. Through the centuries, other flavorings have been added in lieu of, or in combination with, rose or blossom water, such as lemon zest, orange zest, vanilla, etc. Liquor such as Metaxa brandy, Greek mastiha,or ouzo are sometimes added to kourabiedes. After the cookies are removed from the oven and slightly cooled, blossom or rose water may be sprinkled on the cookies before dusting with sugar to help the coating to stick, although this method seems not be used any more. We continue to do this in Cyprus for Loukoumia tou Gamou, our Wedding cookies. Modern versions of kourabiedes now include other non traditional ingredients as well. I have been making kourabiedes for many years and a very significant factor to have tasty kourabiedes lies mainly in the quality of butter used. This year I made them with a butter I never used before and quite frankly I was really afraid what the outcome would be. I asked my husband to bring sheep’s butter and instead he brought a Cretan butter called Stakovoutyro, made of sheep’s and goat milk. Staka is the fresh cream skimmed off the top of milk and Stakovoutyro is the buttercream (like clotted cream) made by cooking staka. I know that all Cretan products are delicious but I didn’t know if I could use this butter to make kourabiedes. On the back of the jar it said suitable for cooking and for desserts, so I risked making them and the result was fabulous. If you cannot find ewe’s or goat milk butter these can also be made with regular butter, although they will lack the characteristic taste, they will still be delicious. They were perfect in taste and each bite they melted in your mouth, making you want to eat more and more. You can get the recipe by downloading my free e-book just by subscribing to my blog. This recipe also goes to Rosa, of Rosa’s Yummy Yums, for her even Pastries For Peace. This recipe goes to Cinzia of Cindystar, for her event Baking under the Christmas Tree. You can find many more Greek recipes in my cookbooks «More Than A Greek Salad», and «Mint, Cinnamon & Blossom Water, Flavours of Cyprus, Kopiaste!» both available on all Amazon stores. Read more here. Kourabies (pl. 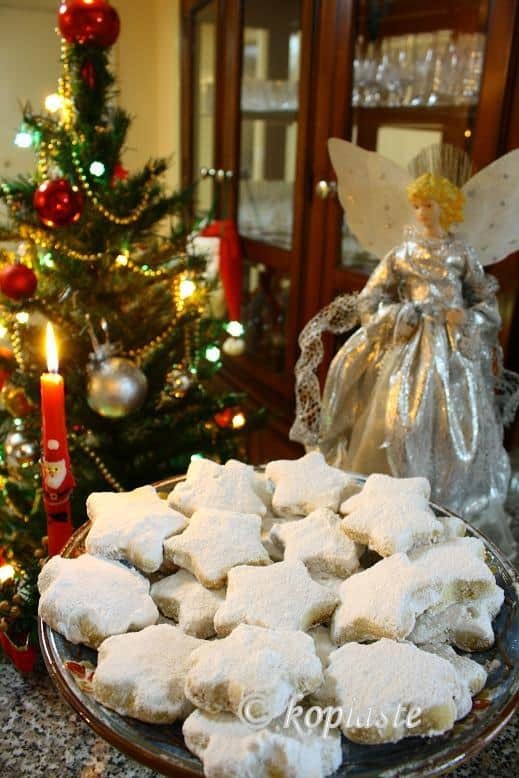 kourabiedes) are the Greek shortbread cookies made during Christmas. In the older times, before the use of the mixer, these cookies needed elaborate preparation and that was done by hand, so these were made for special occasions such as weddings, christenings and other celebrations. Blanche and roast the almonds in a preheated oven to 180o C / 350o F, for about 15 minutes. Allow to cool and then coarsely cut them into small pieces. Sieve the flour and then sieve the icing sugar, separately. Beat the butter with the icing sugar at low speed until incorporated and then beat at high speed for ten minutes until it becomes white and fluffy. Add the liqueur (or ouzo, brandy or rum) and vanilla and add two thirds of the flour and mix. Stop the mixer, add the almonds and continue mixing by hand, adding the remaining flour gradually until the dough is soft but not sticky on the hands. You can manually shape them into crescents or round balls or remove the dough on a non-stick working surface or on parchment paper and flatten the dough about 1 cm. Cut with a cookie cutter and place on a baking tin lined with parchment paper, spaced apart. Bake in a preheated oven to 180o C / 350o F, for about 15 minutes, depending on your oven. Remove from the oven and turn them upside down. Using a sieve, sprinkle some icing sugar and then turn them again. Continue sieving until they are coated and then place them in a platter. The size of each kourabie before baking should be round 30 grams each. Before sieving the icing sugar on the kourabiedes, you can spray them with some citrus blossom water, for extra aroma. The icing sugar used may be sieved and used again. Happy Holidays and a Merry Christmas to you all!! Love the stars! Stakovoutyro sounds quite interesting! Love them Ivy! They look delightful! Nice tree and decorations! Cookies look beautifully baked. Right in time for the festive season. These are so pretty Ivy! And I bet they are just heavenly tasting! Wow, your kourabiedes look phenomenal. I am definitely making these. Great idea of making them with a cookie cutter. I have silently been reading your beautiful blog for a while and would like to thank you for all these lovely recipes you are sharing with us! I love Greek food and have made several of your recipes which were fantastic. I am definitely making these. I love these and the addition of the mastic liquor sounds lovely. These look lovely Ivy, and your angel is so pretty. O your tree looks lovely Ivy … makes me miss Christmas back home … not the same at all here! The cookies look great … I am sure taste great too! I think I will do this one with my daughter tis the season for cookies of course! Merry Christmas! Je vais tester tous tes gâteaux de Noël. Ils me plaisent tous. Those cookies look wonderful!! !Great pictures. I love the first picture, so Christmasy! I love the twist you gave these cookies this time. I need to start baking my cookies soon. Love the idea it is fully covered with icing suagr which gives a real christmas feeling to it. I have never know you could have butter mixed with sheeps milk and goats milk. Thanks everybody for the lovely comments. I've been very busy these days (like everybody else) and have only some hours in evening to post and hope to be visiting all of you soon. That's a beautiful first photo! You should make it your Christmas card. Cool….I made some star cookies last year….maybe I should make some for this x'mas too! And you have a very beautiful x'mas tree. Ivy, your home looks so warm and inviting. And I love those cookies! Isn't it nice when a product we've never tried before manages to please us beyond expectation? The cookies are lovely, in their star shape. I love kourambiedes! I decided not to make them myself this year (there will be plenty when I visit family of course) but i agree the quality of butter makes a big difference. Glad your results were great, and I love your stars! How fun and festive! Love the decorations! Stakovoutyro is a wonderful butter! Women in Creatan villages make their kourambiedes with a combination of stakovoutyro and olive oil making the dough crunchy. When made well, Kourabiedes cannot be beat and with all that butter…they last a long time! Happy baking. These remind me of our ghraybeh (even the name sounds similar) which are shortbread cookies. I like the addition of mastic liqueur especially. Here we use the mastic pebbles ground with a pinch of sugar, I had no idea you could get this liqueur! with the exception of the mastic liqueur, these are exactly the way my yiayia taught my father to make kourabeides so that he could teach my mother and me. I have tried variations over the years, but this simple recipe is always always the best. And I love the star shape! Cookie cutters — what a great idea!